Registration can be done by registering on our home page or after placing an order in our e-shop, where registration will be automatically offered to you. Once you have registered, after loggin in you will see "User name" and "Number of loyalty points" in the upper right corner. Click "Username" to access your account. There you can view or edit your billing and shipping addresses, track your order history, go to your Loyalty Programme page, or change your password. Click "Number of Loyalty Points" to go directly to the Loyalty Programme page. From there, you can exchange loyalty points for a discount coupon that can be applied to any of our products. The coupon has a validity of 90 days. 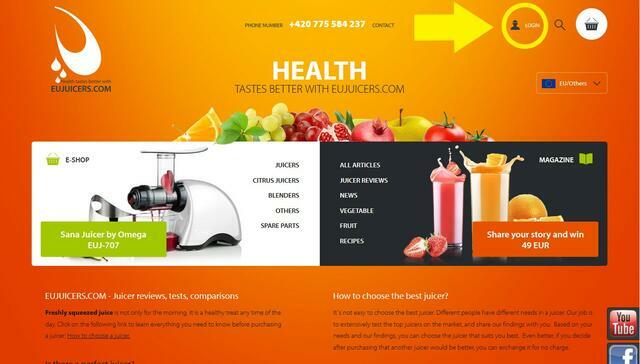 The Loyalty Programme is valid at both of our sites: www.sana-store.com or www.eujuicers.com. Purchases from both sites apply points to your same Loyalty Programme account. How to earn points in the Loyalty Programme? How can loyalty points be used? It's up to you how to use your points. You can exchange them for a discount coupon to be used for your next purchase. You can use them for a discount for family or friends. You can even combine coupons with friends. Points are valid for 24 months and can be accumulated for larger discounts. On which products may I use my discount? Points can be used for a discount on any product which doesn't already have a discount applied. That means all products except for any which are on sale. They also cannot be applied to spare parts purchases for which you already have a discount. Points can only be used for products which are in stock at the time of purchase. Points cannot be exchanged for cash. They can only be used as a discount on purchases. Thank you for shopping with Sana Store and EUJuicers!